I’m a Ph.D. candidate in the final stages of my program: these days I’m crunching out analyses and writing papers as I prepare to submit my thesis at the end of the term. As a community ecologist, I spend a lot of time thinking about how and why different species assemble together in space and time. 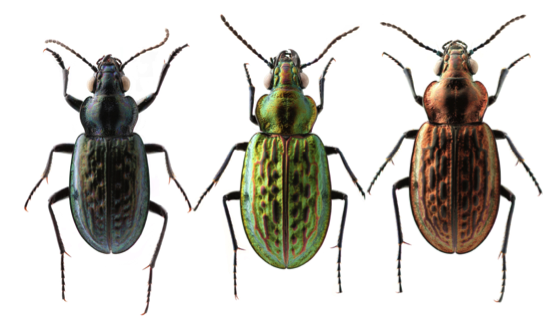 These questions are foundational to the study of ecology and provide the overall framework for my research program, which uses beetles and other ground-dwelling arthropods to study the structure and determinants of terrestrial animal assemblages. 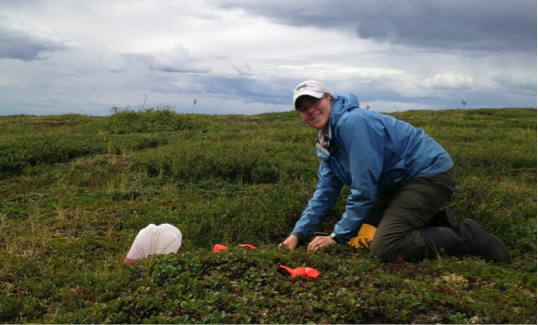 I have spent my summers conducting field research in gorgeous, remote regions of our northern territories, including Kugluktuk Nunavut and the Dempster Highway in the Yukon. My colleagues, members of the Northern Biodiversity Program, have contributed to the collection efforts as well, resulting in specimens being obtained from twelve different locations in the boreal forest, the subarctic and high arctic, spanning Canada coast to coast. I’m now neck-deep in the joy of interpreting the stories contained in my collection of specimens. I’ve taken two approaches with this work. First, I’ve used a fairly traditional taxonomic approach to studying these animals: by identifying them morphologically (with a microscope and identification keys), I can associate each individual with a known insect species – although some new species have also been discovered! With this information I can describe the species richness (diversity) and distributions of different beetles in the north, and see which species are associated with each other at different northern locations. Secondly, I’ve looked at my arthropods from the perspective of their ecological functions – their roles in their environments. For example, some insects are responsible for pollenating plants, others are important decomposers, and others still are predators; arthropod assemblages can therefore be described in terms of the diversity and dominance of different functional groups. I am in the process of comparing taxonomic and functional assemblages found across northern Canada, and working to determine what aspects of their ecosystems (things like: temperature, wind, and sunlight; the diversity and structure of the plant community in which they live; soil characteristics) are associated with the way these assemblages are structured, and how they change over time and across space. 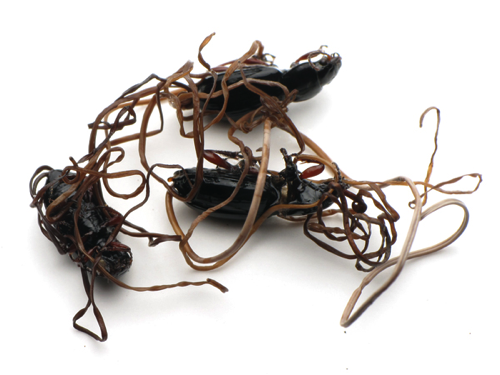 A fun complementary topic I’ve researched is the relationships between some high arctic ground beetles and a fascinating group of parasites called hairworms. I found a number of beetles from different locations to be infested with these worms; in one instance almost a quarter of the beetles were infected! The parasites are aquatic as adults and must first infect an aquatic insect (like a mosquito larva) before being transmitted to a terrestrial host (like a beetle) via the predation of the aquatic host by the terrestrial insect. To complete their life cycles, the worms somehow compel the beetles to enter the water, effectively forcing them to drown themselves so that the worms can emerge safely into their aquatic habitat. 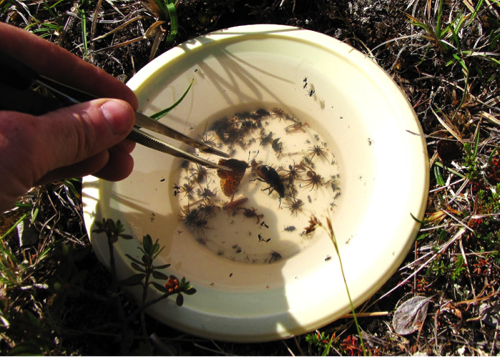 This discovery suggests an important link between the creatures living in terrestrial habitats and those in aquatic habitats and tells us about the arctic food chain: beetles must be eating mosquitos or other insects that have aquatic larval/immature stages. These prey items may, in fact, be a very important source of food. More work needs to be done to confirm this! In the meantime, I am excited to have found these associations – the fact that these particular species of beetles can be hosts for hairworm parasites is new information, and it appears that the parasite itself is a new species! When I’m not writing my thesis or putting obscure little black beetles on pins, you can probably find me working at McGill’s Teaching and Learning Services, enjoying my time as a teaching assistant, networking on Twitter, mucking around in my vegetable garden (or putting said veggies in jars), walking my dogs, enjoying nature while canoe tripping with my partner, poking wildlife, or lifting heavy things at the gym. I’m on the hunt for a fantastic postdoctoral position that will allow me to continue studying different communities of living things in other ecosystems, and that factors that affect how they’re put together, and I’m excited about the many opportunities out there! 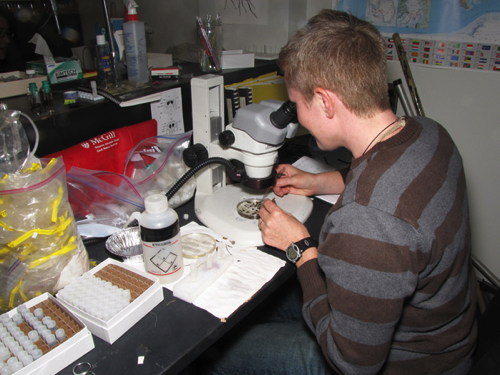 ← Meet the 2014 Arthropod Ecology Lab!